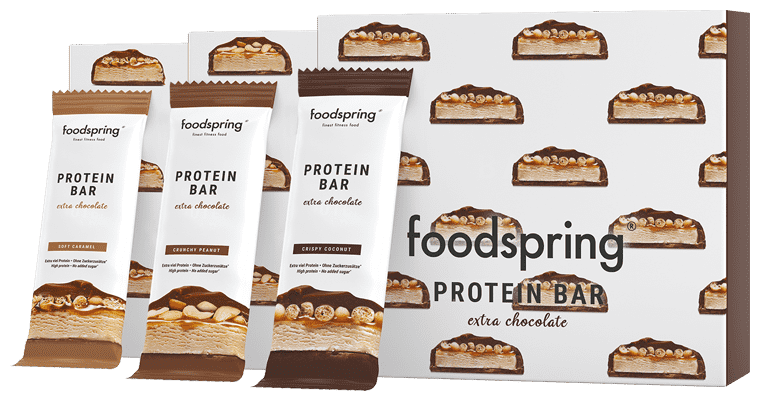 Protein by foodspring is 100% healthy: We source milk from free range grazing cows that are fed on natural grass instead of artificial concentrates. That is why our proteins are completely free of harmful and unnecessary additives. Each one of our protein shakes comes with the promise of a gentle, nutrient-friendly and certified production process carried out exclusively in Germany. For sweetness, we add plant stevia in combination with sucralose, and sustainably farmed raw cane sugar for our organic protein. As a result, our proteins taste wonderfully natural. We are also one of the first providers in the German market to insist on certified organic protein in our product portfolio: organic protein. Our protein powders will help you to achieve your personal training objectives. Protein is a building block of our body. The functioning of skin, hair, muscles, etc. are disrupted when the intake of protein is insufficient. Proteins consist of 21 different amino acids. Eight of them are essential amino acids that the body cannot produce by itself. They must be absorbed from food. Protein is therefore indispensable and clearly more than a required aid for muscle building. A protein shake is a healthy meal as much for exercise performance as for weight loss. Proteins, along with fats and carbohydrates are the energy suppliers. Ever since Sylvester Stallone entered the ring for the first time as Rocky Balboa in 1976 and ate raw eggs to make himself fit, they have been linked to exercise, muscles and performance. What many don’t know, is that protein is also fundamental to life itself - up to 20% of the human body is made of proteins. Proteins are classified based on their biological value. The biological value describes how effectively protein that is consumed can be converted into bodily protein and then be available as building material. The biological value of a whole egg, 100, is used as a reference value. Food supplements such as whey protein or 3K protein have a high biological value of 104-120. This means an especially fast and effective absorption in the body. A mix of animal and plant protein sources is recommended to increase biological value. As described, proteins are a basic building block of the body. The most important function of proteins is to supply muscles with essential amino acids and the maintenance of normal skin and hair structure. Apart from this, they regulate balance and support different enzymes while processing nutrients. Additionally, proteins transport vitamins (A, D, E, K) and iron in the blood. Building and breaking down of proteins are processes that take place in the body everyday. To summarize, this is the nitrogen balance. It is important to have a positive nitrogen balance to ensure muscle building or maintenance. Proteins cannot be stored permanently and must be consumed daily through food or supplements. The biological value of your protein intake can be optimised by consuming different, but complementary proteins. One good way is to also consume protein shakesalong with a balanced diet, in order to cover any deficits if you have higher requirements because of exercise, for instance, or if there’s less time to cook. Above all, if the goal for the time being is reduction of body fat, a preferential intake of proteins in the meal is recommended, as this has a lot of advantages. Protein is therefore indispensable and clearly more than a required aid for muscle building. A protein shake belongs to a healthy diet, as much for exercise performance as for weight loss. Proteins, along with fats and carbohydrates are the energy suppliers. Ever since Sylvester Stallone entered the ring for the first time as Rocky Balboa in 1976 and ate raw eggs to make himself fit, they have been linked to exercise, muscles and performance. What many don’t know, is that protein is also the fundamental basis for life - up to 20% of the human body is made of proteins. Proteins are classified based on their biological value. The biological value describes how effectively protein that is consumed can be converted into bodily protein and then be available as building material. The biological value of a whole egg, 100, is used as a reference value. Food supplements such as whey protein or 3K protein have a high biological value of 104-120. This means an especially fast and effective absorption in the body. A mix of animal and plant protein sources is recommended to increase biological value. The goal of body toning is the largest possible loss of body fat while simultaneously retaining muscle. Protein goes to work here. You improve your feelings of satiety and thus contribute to easily maintaining the required calorie deficit for losing weight. How does that work? Digestion of proteins is significantly more complex for our bodies than digestion of carbohydrates. Proteins are broken down in our bodies into individual amino acids by enzymatic activity and only then processed further. This process takes significantly longer than the breaking down of carbohydrates or fats, which is why proteins keep you feeling full longer. The proper mix of different protein sources makes the difference. Different types of protein are processed differently and absorbed, therefore it is worth emphasizing a varied intake of protein. Proteins from animal sources are of highest quality: Whey, casein and egg protein. Plant sources of protein such as peas or rice should be a part of the meal plan and are also suitable for vegetarians or vegans. Whey protein is a favourite protein and a classic with weight training and especially with building muscle mass. Compared to casein, whey is an easily and quickly digested protein. The essential amino acids (BCAAs) are transported in blood within seconds and remain available there for building processes and support protein synthesis. Whey protein is quickly absorbed by the body, making it ideal for training with the purpose of increasing muscle mass. 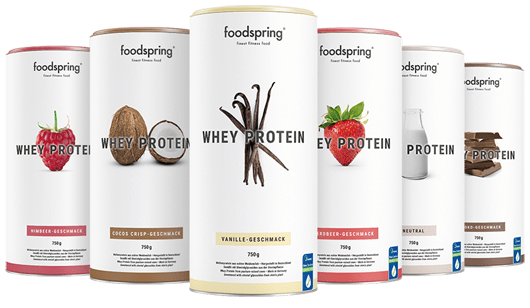 Whey protein from foodspring is impressive from the quality of raw materials to the instant solubility of this protein powder for the finest, clump-free protein shakes. Shape Shake is the first choice of our customers with the goal of body toning. The formula, with protein from grass-fed milk, vitalizing L-carnitine and inulin, the plant-based fibre from chicory root, make it the perfect, filling meal supplement. Shape Shake can optimally be used in addition to lunch or dinner. Calories are saved, cravings are prevented and body toning is wisely supported. Our organic protein from organic milk protein plays a particularly important role. This protein powder impresses with the certified quality of its organic sources, natural aroma and the use of real vanilla beans from Madagascar and cocoa powder from Peru, as well as being free of artificial sweeteners. Natural raw cane sugar is used for sweetening. Our protein powder is the ideal supplement for everyone that emphasizes organic sources for their food. You can maintain this approach while training to build muscle, in muscle definition, in performance training or simply while enjoying a delicious meal supplement. Casein is a part of milk and is used while making cheese. It has an anti-catabolic effect. Casein keeps the body constantly supplied with protein for up to 7 hours thereby ensuring an optimal amino acid balance. Casein has a creamier consistency than whey protein and makes rich shakes. It is also particularly suited for giving a steady supply while you asleep. This is why casein is often labellednight protein. Casein protein also lends itself for the baking of protein rich foods. Egg protein contains several essential amino acids (leucine, isoleucine and valine) and this gives it a high biological value among food sources of proteins. A whole egg, with a value of 100 used to be considered the cleanest, purest protein. Egg protein, with a value of 88, doesn’t completely reach the levels of a pure egg, but fits ideally in a multi-component protein by supplementing and completing the amino acid ratio reasonably. Soy protein is a plant-based protein alternative. Because of its low fat and carbohydrate content, soya protein is particularly suited for women for body toning or for muscle definition in men. The speed with which soy protein is absorbed and processed lies between that of whey and casein. Soy protein is particularly rich in L-glutamine and L-arginine, amino acids that form the basis of muscle building processes. Apart from this, soy protein has a high fibre content and keeps you feeling full longer than whey protein and co. Soy protein is a wholesome alternative for those avoiding animal proteins. Vegetarians seeking to build muscle will also find a protein shake with soya to be a good plant-based alternative to whey protein shakes for achieving muscle growth. We have provided the advantages and disadvantages of soy protein as well as better alternatives for you. We recommend caution with wheat protein. Among the common proteins used in protein shakes, wheat protein has the lowest biological value (BV 60) and cannot be efficiently converted into bodily protein. Wheat protein is also called wheat glue among experts, as it is relatively hard to digest. Many manufacturers however use this cheaper wheat protein in large quantities. Exercise caution with unusually cheap products. It is our opinion that wheat belongs in bread and not in a high quality protein shake. The German Nutrition Society (DGE) sets the guideline for protein intake at 0.8 grams of protein per kilogram of bodyweight. This value quickly increases to 1.5-1.7 grams of protein per kilogram of bodyweight if the person exercises. An athlete weighing 75kg, for instance, requires 127.5g of protein (75kg x 1.7g). The daily requirements for those engaged in high performance and power sports lies at up to 2.5g per kilogram of body weight. As you can see there’s no perfect solution for daily protein intake as this depends on individual body requirements. Balanced nutrition is imperative to ensure protein intake and cannot be completely replaced with protein shakes. However, shakes provide support during exercise as the need as well as the distribution of protein intake can be quickly and easily spread out and met throughout the day. Proteins are also not the holy grail of nutrition. Intake of other macronutrients cannot be neglected. Protein should make up a maximum of 30% of a balanced diet while carbohydrates should be 50% of the diet and 20% should be fats. Carbohydrates are the most important energy suppliers for the brain and muscles and fats perform basic functions as well. Generally, we can state that a balanced diet is the basis for a healthy body and supplemental foods cannot replace this. 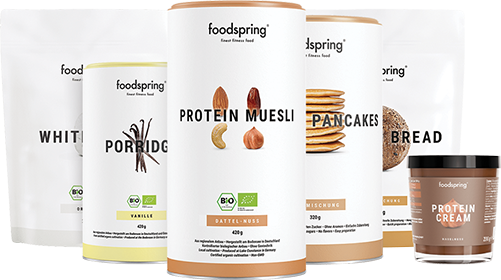 At foodspring we have a range of products that help athletes meet the high requirements of a good diet. Whether on days of intense exertion or days without training - the body must be supplied with proteins and amino acids, to reach goals. Protein shakes are a simple and quick supplement to a balanced diet. The use of proteins is a recommended aid for recreational and professional athletes when certain prerequisites are met. What should you pay attention to while buying high quality proteins? Before purchase, you should be clear about the goals you wish to achieve from the additional intake of proteins. Factors such as the composition of protein, nutrient distribution, taste as well as additives should be considered. High quality proteins are produced using select materials and have high solubility, natural taste and are free of harmful ingredients. High usability of the proteins by the body indicates a product of highest quality. Apart from the ingredients and properties of the protein, it is also important to pay attention to the respective manufacturers and their transparency pertaining to sourcing of ingredients and production processes. Not all proteins are equal. We want to do something good for your body. 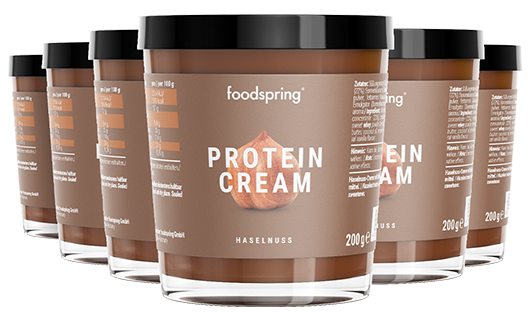 Proteins by foodspring are therefore made of premium materials and use milk from free range cows which are predominantly grass fed. This is how we ensure maximum purity, without residues from contaminants. We use plant-based sweeteners from stevia leaves along with sucralose to subtly sweeten our proteins. Production in instantly mixable quality ensures that it is a perfect delight to drink. This means the highest solubility, whether in water, milk or other similar products. With our organic protein, we are also one of the first suppliers of a certified organic protein powder that is organically sourced. With this, we’re making our mark on organic agriculture and sustainability.